“So alike” . . . ??? Updated 6/19/2013 Episode: 65 (Sakura, Yukito, and Disappearing Power), cut 236. 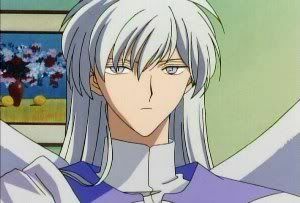 Yue stoically accepts Touya’s terms for transferring his power, with a little sigh of resignation, making Touya smile and remark, “You guys are just so alike -- Yuki and you.” Yue responds with this long, hard stare that combines several emotions: irritation (he’s not happy having a false form, after all), profound puzzlement (“Alike”? How? ), and an alien determination to gain and make use of Touya’s power. Sequence number: A1 END (Yue), B1 (eyes and eyebrows). This is one of those moments that CLAMP and Madhouse could easily have botched. Yue could have been shown as happy to receive Touya’s power, and “The” Scene thus could have turned sentimental or, worse, explicitly shōnen-ai. 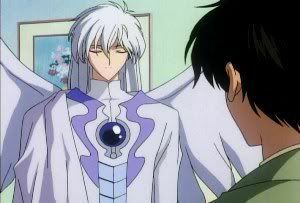 But Yue is not human, and his priority while he’s in this form is his job -- being a Protector. After all, he needs the power to do what he’s been created to do, and now he intends to get it. That's the main thing, for the moment, not Touya's reasons for letting him have it. And so Yue, both in the manga (see below) and in the cel above, is rivetingly impersonal -- a total contrast with Yukito’s vulnerable charm. 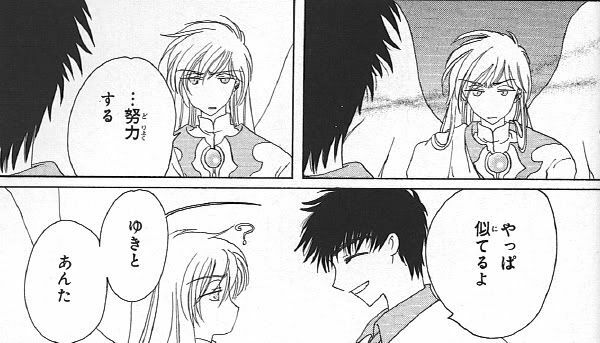 And yet Yue and Yukito truly are -- “so alike” -- in ways that Touya can see (and later Sakura as well). For the moment, though, Yue and we viewers remain utterly, totally baffled by this remark. A gorgeous cel, with crisp trace lines and an unforgettable look; and unlike my other “Scene” cels, it’s one of a kind. 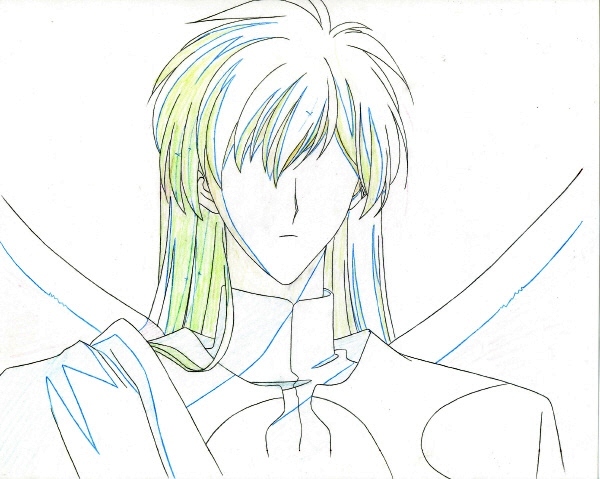 I don’t have many Yue cels, but if you’re going to have a few, they might as well be like this one. Yowzers! Ah, who cares! 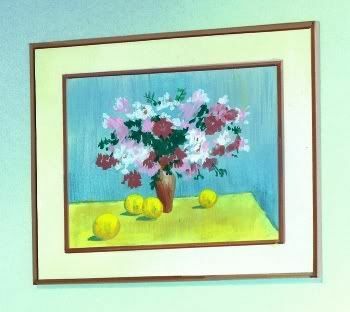 That still life hanging on the wall has become part of CCS aficionados’ life, and I vaguely recall that at least one Beta curator actually commissioned a replacement bg of this wall, complete with a tiny replica of this picture, for one of her cels from this Scene. It’s a delight to have an original copy of the painting that actually went under the camera, even if it’s not from this exact cut. But -- one wonders -- why should this silly still life with the peaches and the flower blossoms be so significant to us CCS fans? Ahhhhhh -- the name Touya means “peach blossom,” ne?